Darius is a fusion of hilarity and humility. He stared public speaking at his grandparents church at a young age. And, once he saw how words could touch people, he began his comedy career. From hosting at the world famous Improv comedy club to competing in top comedy contest. His clever, smooth style makes him a crowd favorite where ever he goes. As a kid I used to go up in church, give a speech and throw in some humor. 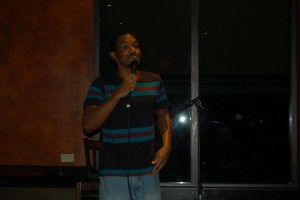 I saw the way it made people feel and that is what motivated me to want to do stand-up comedian. Local: Tim Hanlon, his humor is so much of him and what he thinks is funny, Ridiculous, because he is who he is and he doesn’t care what others. Fasil, because he has a unique style and continues to add new facets to his arsenal of jokes (I didn’t pay him to say this), Artisse, because of his conversational style of humor and Matt Bellak, because his humor is so honest and it comes from a sincere place and he can go to the most darkest of places and still make others laugh. Dave Chappelle because he can make you laugh at anything, Jerrod Carmichael he can take something that is dark and make you laugh about it, Katt Williams he brings a very energetic persona to the stage while saying things that are thought provoking as well. Jesus, because I love him and I feel him that he has the best set of superpowers in history. When I go to restaurants I usually order water because it’s free and with Jesus I will be able to have my water turn in to wine for free. I would take him to church. Kanye West, because we have the same shaped head and are both passionate about what we are doing. We just express it in different ways. I don’t like when comics discourage newer comics. I feel that comedy is already something that has road blocks and other comics shouldn’t discourage newer comics because It’s a brotherhood where people should encourage each other. Everyone should be at least sit on a comedians table because it takes a lot of guts to get on stage. Scrambled eggs, because I am pretty good with making them by keeping it simple as I like bland food plus it’s a good source of protein and Ramen noodles. I hope to get famous one day so that I can hire a cook to cook me scrambled eggs. At one point I was living pillar to post and even living in my car. I feel like as long as you have persistence and you have faith. First and foremost in the faith of god has helped me and my faith in the gift of comedy that god has given me. Thanks to god not only am I no longer living in my car but I was also able to advance as a Finalist of Florida’s funniest and get consistent work at the Improv. Thanks to god I am in the right direction on my way to being where I want to be. Stay focused and believe in yourself. There are obstacles that will get in your way and things that will try to destroy your confidence. As long as you think that you are funny that is all that matters, because if you believe in yourself and you work hard good things are bound to happen. 10. Why should people check you out at the Palm Beach Improv this weekend? Because the show is comedy presented in such a different way that resonates with a wide variety of people. It will be different than any other comedy presentation that you had ever seen.